just you and me baby...: Santa, Santa, ho ho ho! Santa, Santa, ho ho ho! 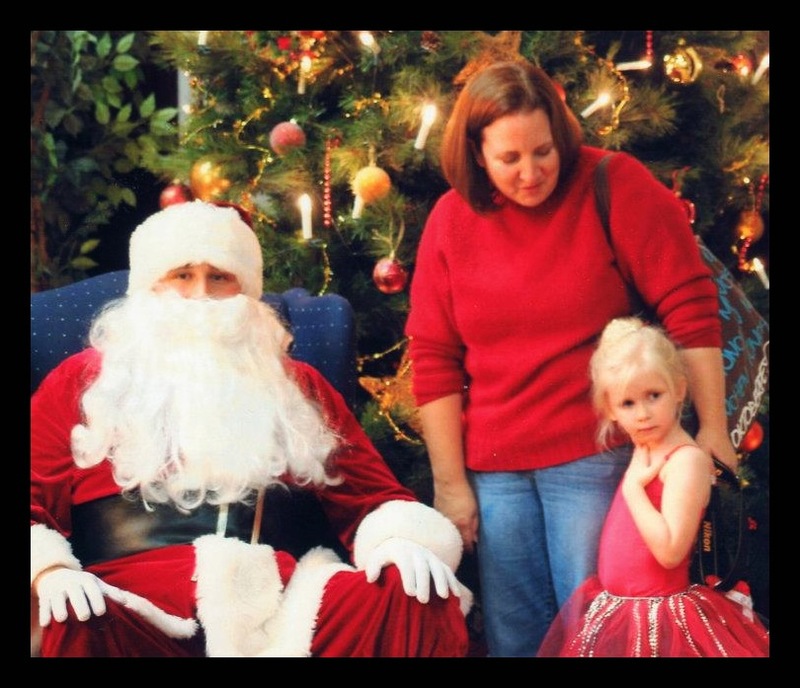 Does your child believe in Santa? My daughter has gotten a letter from Santa postmarked at the North Pole every year and she loves it. She talks about him almost non-stop during the holidays. She has even gotten an e-mail from him the past two years (make your own) and she lights up when he talks to her (from a safe computer screen distance away)... but try to get her to talk to him in person and you would think he was a serial killer coming to take all her toys away! We have no pictures of her with Santa for her first two Christmas's so either something horrible happened and I have blocked it out, or we didn't even try. (or both!) Here is a sampling of what we go through every year. This took some coaxing, but not too bad. See how she is eyeing the present on the floor? And now she is maintaining a safe distance from Santa as she snatches her present. 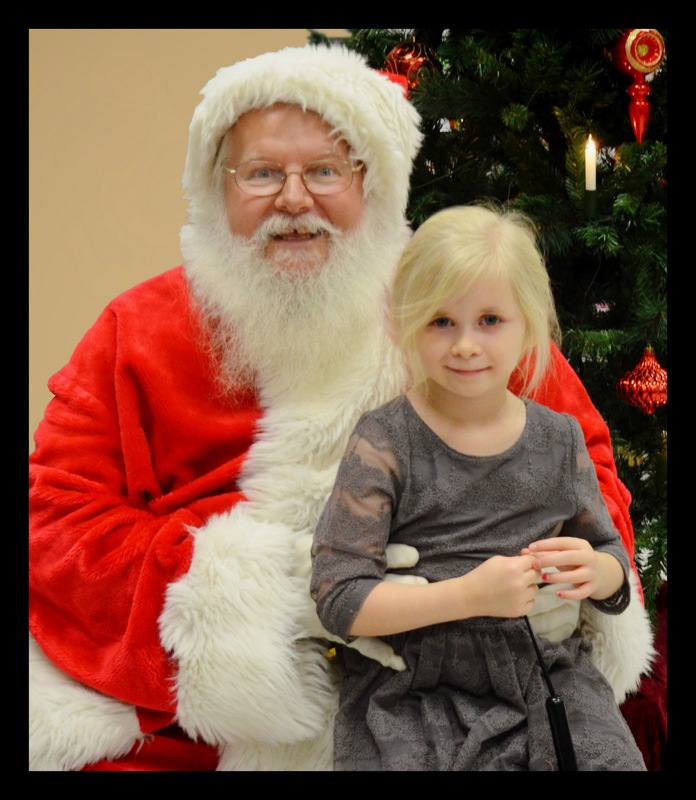 This photo took a lot of tears and approximately 2 hours to get, and although it appears we are right next to Santa, we are actually about 3 feet in front of him. She didn't speak to him at all. This year she again wanted absolutely nothing to do with this Santa and since there were a ton of people in line behind us we had a very limited time to whimper next to Santa. She did give him a high five, but she wouldn't detach herself from my leg so I could try to take a photo of my own. It's Grandpa Santa again. She's smiling. There were no tears today so I guess that's progress! We did have to wander around the PX for an hour and a half until she agreed to go give him a high five. Once she got close to him she did told him what she wanted and sat with him for a photo. It made me happy anyway. She kept saying, "I'm shy mom!" I'm afraid by the time she outgrows this stage she won't believe anymore. When she was done she asked where her present was. I couldn't figure out why she thought she would get her present from Santa today, but looking at the pictures from 2 years ago I think I figured it out. Who says kids can't remember things? Just the things you want them to remember right? Are you children scared of Santa?